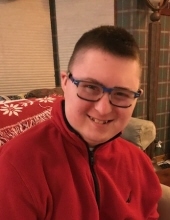 William Alexander Harris, age 21 of Bolingbrook, IL passed away peacefully, Tuesday, April 9, 2019 at Ann and Robert H. Lurie Children’s Hospital of Chicago, surrounded by the love of his family. He was born October 25, 1997 in Voorhees, NJ to his beloved parents, Joseph and Jeanette Harris. Loving brother of Patrick J. Harris. Dearest grandson of Edward and Anita Wenzke of Egg Harbor Twp. NJ, and the late Alvin and Regina Harris. Loving nephew of Paul (Heidi) Wenzke, Mary McCormick, Beth (the late James) McGovern, Peter (Eleanor) Wenzke, Al (Nancy) Harris, Elizabeth (the late James) Curtin, David (Jodi) Harris, Robert (Jeannie) Harris, and Regina Harris (David Bliss). William was our real-life Incredible Hulk. He was always happy-go-lucky in spite of a 2.5 year treatment course for leukemia, multiple episodes of respiratory failure and ventilator dependency, and most recently multisystem organ failure. He was never without a smile and was happiest when those around him were happy. He simply loved life and loved his family and friends. Ocean City, NJ was a special place for him, especially when he was eating ice cream and cheese puffs on the beach! William loved his once in a lifetime Make- a-Wish trip to Disney World over Christmas 2013 where he met his Toy Story heroes. Special Olympic basketball was his favorite hobby and he was lucky enough to win a gold medal with his team in his rookie year! His peer helpers, teacher, school friends, and nurses will always hold a special place in his heart, as they ensured that his days were meaningful and filled with memorable experiences. William especially enjoyed his religious education time through the REACH program at St. Raphael parish. He always felt surrounded by love and truly impacted all of those who touched his life in so many ways. We would like to thank the doctors, nurses, respiratory therapists, and the entire PICU staff at Ann and Robert H. Lurie Children’s Hospital for the incredible care provided to William during our lengthy stays. William will never be forgotten. He was a true superhero and warrior in all aspects of his life and was loved by so many. He was an angel on earth who modeled kindness, compassion, and harmony. In William’s honor, let there be peace on earth and let it begin with each of us. Memorial donations to off-set medical expenses may be sent to Friedrich-Jones Funeral Home. Donation of flowers will be made to Connections Transition Services, the program that William attended that fosters job skill development for young adults with disabilities. Visitation: Sunday, April 14th 2:00-6:00 PM at Friedrich-Jones Funeral Home & Cremation Services, 44 S. Mill St., Naperville, IL 60540. Mass of Christian Burial: Monday, April 15th 10:30 AM at St. Raphael Church, 1215 Modaff Rd., Naperville, IL 60540. Interment will be private. To send flowers or a remembrance gift to the family of William Alexander Harris, please visit our Tribute Store. Memorial donations to off-set medical expenses may be sent to Friedrich-Jones Funeral Home. "Email Address" would like to share the life celebration of William Alexander Harris. Click on the "link" to go to share a favorite memory or leave a condolence message for the family.